Horology is the science or art of measuring time or making timepieces. 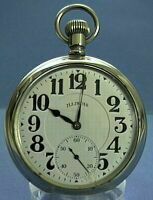 This site has pictures of vintage and antique wrist watches and pocket watches that have been restored. All are mechanical movements. Most are offered for sale on Ebay auction. There is also information about the watchmaker, also known as a horologist. We offer mechanical watches, mainly at auction on the internet, and most have been cleaned and oiled, every part removed and put into the L & R cleaning machine (unless otherwise noted) . I use the old fashioned cleaning machine because it is the kind I started with after WW II when they first came on the market. The jewels are all cleaned, the balance jewels are removed and cleaned. The watches are oiled and adjusted when they are reassembled and then they are regulated to keep accurate time. Watches are lubricated with watch oil that works better than the lubricants used in the original assembly of the watch. The mainspring is replaced with a new white alloy spring of the proper size that will be a lifetime (of the watch) feature. This is an improved feature for the vintage timepiece. The old metal used in the mainsprings would "set" and the power source for the watch would lose it's strength. I can remember using the pre-alloy springs that seemed to break more easily when there was a thunderstorm. In those days often the spring would break before the watch needed cleaning. Maybe it was a combination of the thunderstorm and the humidity that went along with it, that caused the failure. Glass crystals are used to replace missing and scratched glass for the pocket watches and plastic is used for the wrist watches we restore. This restoring process takes time and time is taken as needed to get a watch that runs accurately. The process is rewarding to see a vintage watch running and accurately keeping time. Most of the watches are pocket watches - 12s, 16s & 18s. Most of them haven't run for thirty or more years so the dirty watches cause the changing of cleaning solutions more often than back in the forties and fifties when I first started learning to repair watches with my father. My father learned the trade in Kansas City, MO, in the twenties and started his own shop in 1930. What a year to start a business! I can remember him exclusively using sawdust to dry the movement parts that had been strung on a thin guitar string and his shaking the cigar box with the parts drying after their chemical dips and having been "pegged" to clean the jewel holes. The fascination of watches got me out of the great outdoors of Central Pennsylvania into my father's shop to see the watches tick. My father was always patient with my questions and curiosity. I remember the day when I was exploring his bench and I pulled the top drawer out too far to see what was in the back. The drawer crashed to the floor and I thought the whole game was over. I can't even remember him even scolding me for this mischief. It was his patience with me that encouraged me to learn what he knew about watches. Those were the days when he bought a Hamilton Model 22 marine chronometer from the factory in Lancaster as "surplus" for sixty-five dollars. I still remember going through the Hamilton factory in Lancaster. We sometimes flew there. My dad had a B-13A (surplus WW II) and a Taylorcraft that he had bought from his cousin in South Dakota. Flying from Mount Union to Lancaster in those days was always fun. Dad was as good at flying as he was a good watchmaker. He had over 1000 hours, was instrument rated and rated for multi-engined aircraft. I remember the airport at Lancaster having a lot of grass in those days. We went to Lancaster for parts - Saul L. Solomon & Sons and Meiskeys were two material houses I remember. We also went to The Bowman Technical School where my father got his technical updates on jewelry repair and watch repair. Going by the school was also probably for consideration of it as a place where I might sometime want to enroll. 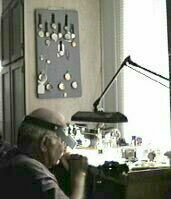 My father was a good teacher so I apprenticed to him and watchmaking is something that I really grew up with. It made it a lot easier when looking for a dropped part, on the floor on both knees and with the question, "why did I ever want to be a watchmaker?" For me the answer is simple - my father did it. For a long time it seemed that all of those marvels of technology - mechanical watches - would reach the scrap heap. Thanks for the collectors and the would be collectors. The interest in them now promises to save what we have left after the gold rush (when the gold price by law was taken off the "standard" and the price went to over $800 from the "standard" of $36 per oz.). Then the gold cases disappeared in droves in favor of the scrap gold prices and a lot of movements disappeared with the cases. It is fashionable to have a vintage watch on display now even if it won't run. If it runs - great. I love to hear the buyer email us that the watch he bought was a reminder of... or just like..... It's the appreciation for the technology and what it represented for it's day and for what it means in today. There are some enduring values and watches tell us more than just what time of day it is. I can remember my father showing me his Hamilton Railroad Watch and pointing out the small dents in the case. The dents were where I had bit the watch when I was teething and in his lap. My mother probably wondered what was maintaining my interest while I chewed on his watch. He probably allowed me to do it as a record of that phase of my development. When we attend a watch mart I look at all of the tables with all of the watches for sale and the tools and the books and the clocks. I can almost relate a memory to each thing I see. Sometimes it's about a customer, about the item when it was new and how it looked in our jewelry store. Maybe it is about what my father thought of the watch or clock or watch band or ...... In any event there almost always seems to be a memory. As a side note, the cleaning and servicing by a watchmaker usually costs between $30 and $150 depending on what area of the country you live in. Plus parts. Bidding at auction on a watch that says " it just needs cleaned" and one that is "running and has been cleaned" can mean a big difference in the final cost to you. The seller may not know if a part needs replaced. It's something to keep in mind when reading auction ads. Electronics were a big part of my life in the US Air Force but I never got interested in electronic watches so knowing that there are still fine mechanical watches in this time of electronic wizardry is reassuring and that people still appreciate them helps make the day at the bench enjoyable. If we didn't like doing this we wouldn't do it. Our guarantee policy is that we want the watch to make the trip to you through US Mail (we only ship this way) and to run accurately for the first twenty-four hours. 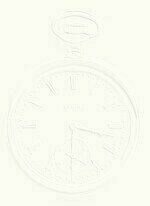 If the watch is damaged in-transit the buyer can send the timepiece back for repairs and we pay postage both ways. The guarantee cannot be a substitute for the buyer taking care of the watch.